Bit bummed out to learn Ray Bradbury passed away last night at the age of 91. He’s one of the first “celebrities” I met at San Diego Comic-Con who was a household name to everyone. I mean, I would mention meeting George Pérez, Jim Shooter, Walt Simonson, Mike Zeck… even Jack Kirby and Stan Lee… and most (non-comics) folks would just nod and go “m-hmm. Cool.” But everyone knew of Ray Bradbury. He was a grandfatherly figure who radiated an aura of marvel and charisma. What I remember most about Ray was his glasses, his voice and shaking his hand was like shaking a catcher’s mitt made out of fresh bread (instead of leather). His sci-fi legacy in print and film is substantial. “Fahrenheit 451.” “The Martian Chronicles.” “A Sound of Thunder.” “The Twilight Zone.” “The Illustrated Man.” And that’s just the tip of the iceberg. Click it to larger-than-lifesize it! Here’s a pic of his autograph from 1986 (in the lower-right part). It’s on a comics backing board. 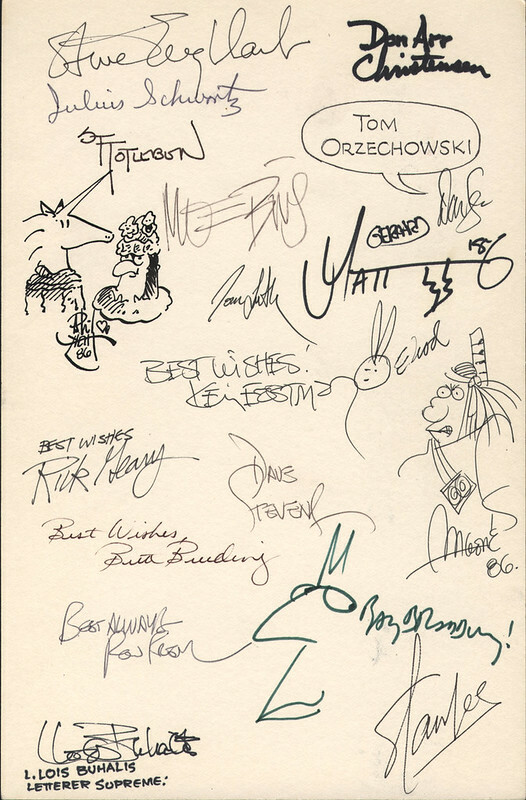 Comics folks will recognize several (if not all) the other autographs by comics luminaries and legends. Sadly, Ray joins no fewer than four others on the board who have since passed away. RIP Ray Bradbury, great author of many of my favorite books: Something Wicked This Way Comes, Dandelion Wine and The Martian Chronicles. I didn’t know about the Godzilla connection! That’s awesome.